The Peterloo Relief Fund Account Book is one of the first documents to be inscribed on the UK Memory of the World Register. The register, an online catalogue created to help promote the UK’s documentary heritage, is part of a UNESCO programme to support and raise awareness of archives. 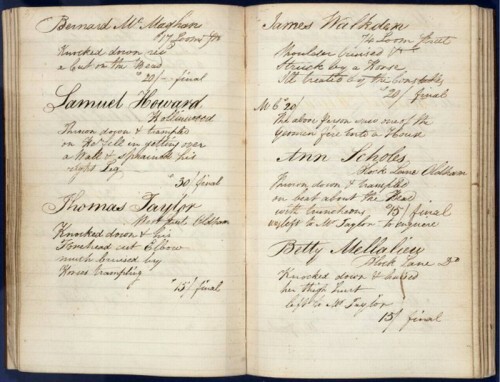 The Account Book records the names of 350 people who received payments from the Peterloo Relief Fund, set up in the aftermath of the 1819 Peterloo Massacre to provide financial assistance to those injured in the massacre and to the dependents of those killed. It also provides details of their injuries and the circumstances in which they were inflicted, with some information on the victims’ backgrounds and characters. ‘The Peterloo Relief Fund Account Book is a unique and irreplaceable manuscript. At least fifteen people were killed and more than 400 were injured at St. Peter’s field, Manchester, on August 16th, 1819, when some 60,000 demonstrators were dispersed by a cavalry charge. The demonstration was organised by the Manchester Patriotic Union to petition for parliamentary reform and the repeal of the first of the Corn Laws and was to be addressed by the British radical speaker Henry Hunt. Nine other documents from across the country and spanning nearly 1,000 years of history are also inscribed on the register. They include the Pont manuscript maps, the earliest surviving topographic and chorographic survey of Scotland dating to between 1583 and 1614, the charter of King William I to the City of London, the oldest document in the archive of the City of London, and a never-released film on David Lloyd George. The film, shot during the last months of the First World War, is thought to be the first feature length biopic of a contemporary living politician.